One of the benefits of running this website is that I often get to interact with first-time thru-hikers of the John Muir Trail. One of the questions I often get is, “Will I need a map?” It’s really a great question and I think there are two answers. If by “need a map” you mean, is a map absolutely necessary to find your way along the trail, the answer is no. There are very few, if any, navigational challenges associated with walking from Happy Isles, to the top of Mount Whitney, to Whitney Portal. The trail is well marked and has ample signage. I would guess that most of the navigational errors made on the trail happen within a mile or so of Red’s Meadow, where there is a spider-web of official and unofficial trails. Mistakes here, though, don’t get you lost—they just mean you take a few extra steps. If by “need a map” you mean, should I bring one, the answer is an unequivocal and emphatic yes. Even if you have walked the length of the JMT more than once, you need a reference in the event you need to bail out, you need to pinpoint a location to assist search and rescue (either the rescue of yourself or someone else), or should you be forced by events (for example, a fire) to leave the marked trail and go cross-country. One more thing, that map needs to be paper, not electronic. All this is a necessary prelude to my review of the AntiGravity Gear John Muir Trail Pocket Profile. If you take my advice and carry a map, I can’t really see the point of bringing this, although, at an eighth of an ounce, the penalty for carrying it won’t be significantly greater than failing to clean the lint out of your pockets. The profile is printed on one piece of water-resistant paper measuring 17 inches long and 3 3/4 inches wide, folded in thirds. 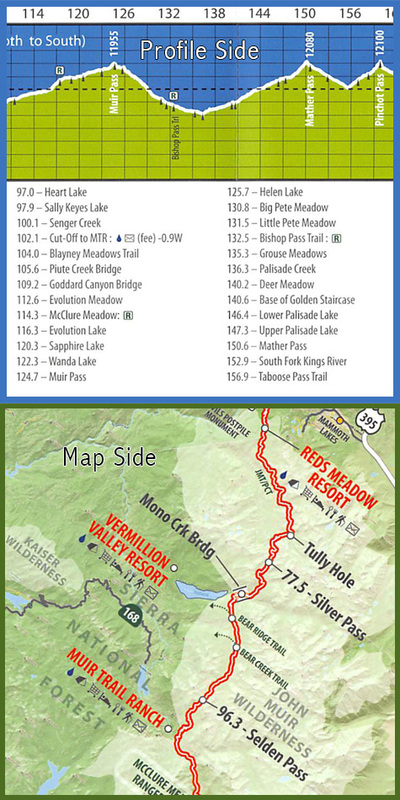 The actual trail profile, showing the entire 211 miles of the JMT as well as the hike down to the portal, is printed on one side. On the other side is a map that depicts the entire length of the trail in less than sixteen inches. A hiker could use this map to gauge his or her progress, to determine approximately where one wilderness area was left and another entered, and to identify major milestones along the way, like the passes, Ranger stations, or resupply points. There would be few uses for it beyond that. The profile, on the opposite side, is flawed as well. I’m actually a big fan of JMT profiles; for daily, routine use (if I’m not leaving the trail) I find a good profile more useful than a map. Unfortunately, the designer devotes only about a third of the 64 square inches available to the actual profile. The rest of the sheet is devoted to white space and a table listing the mileage to milestones along the way, such as lakes and trail intersections. A better approach would have been to cover the entire sheet with the profile and then array the milestones above and below the profile. I might also point out that whomever put it together misspelled north, but that might be piling on. The bottom line is that I can’t really recommend this product, with one possible exception: if you are a trail runner or a fast-packer and are truly carrying the absolute minimum, this might be a reasonable solution. Personally, I think that someone who intends to run the entire trail in five days should still carry a map, but I also recognize that some folks would disagree, and that these risk/benefit analyses are properly the purview of the hiker, not a blogger. For the rest of us, I think there are more useful options. Good review Ray, again. I did not notice the misspelling of North on my own copy. I like it as a show-off item to show people off the trail. I have it on my wall at home and an extra copy in my guide book which I only show to people off the trail. Thanks for the comment, Roleigh. I can see that it would be a good way to orient folks not familiar with the trail. Yeah I like the Erik the Black JMT map. There’s a ton of info in it for resupplys as well. Happy and healthy holiday to you Ray! Thanks, Jack! Same to you!